If you've ever experienced the exceptionally powerful and reverberating sounds of a jet during takeoff, you likely won't be surprised that the noise produced by jet engines is ranked among the loudest of human-generated noises. Understanding jet noise is an intriguing fundamental problem of fluid physics -- beguiling researchers for more than 60 years. Some of this fascination with jet noise stems from the fact that seemingly random fluctuations associated with flow turbulence produce strikingly ordered acoustic fields. In other words: If we can understand how turbulent jets make noise, it will in turn provide a fundamentally new understanding of the turbulence behind it. As a group of University of Minnesota researchers report in Physics of Fluids, from AIP Publishing, they developed a new approach to studying turbulence in jets. Their approach led to the discovery of new coherent modes -- parts of the fluid that flow in predictable patterns -- associated with the dynamics of high-speed jets. The finding helps explain why jets are so loud, and could suggest new approaches for bringing down the volume. "Back during the 1960s, it was shown that coherent parts of turbulent fluctuations inside jets are connected to instability wavepackets, which are linked to noise radiation," said Joseph W. Nichols, an assistant professor of aerospace engineering and mechanics at the University of Minnesota. "A wavepacket is an oscillation that repeats if you look at it over short time and length scales, but when you zoom out you can see it varies slowly over a long distance." This slow variation, for example, may be caused by the jet spreading out downstream. "The same basic principle applies to amplitude modulation [AM] radio, where modulation of a high-frequency carrier wave communicates information about low-frequency speech patterns," he explained. "In jet noise, this carrier wave is driven by fluid instabilities that feed on the energy contained inside the jet. Instead of encoding speech patterns, however, the amplitude modulation of instability wavepackets determines the efficiency and spatial direction at which sound is released from jet turbulence." In recent years, other researchers computed instability wavepackets and found that they predicted peak jet noise for supersonic jets. "For high-speed subsonic jets, however, the theory breaks down -- underestimating sound pressure levels by at least two orders of magnitude," Nichols said. "A prevailing view underlying current industry-standard jet noise prediction codes is that fine-scale turbulence is responsible for this missing sound, and that this phenomenon can only be modeled statistically." 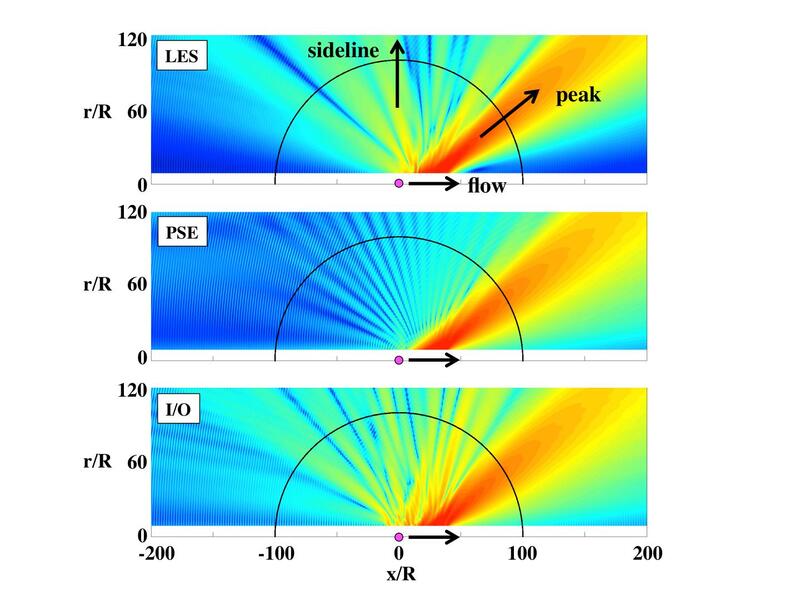 In stark contrast, Nichols and colleagues looked at turbulent jets through the lens of the whole system, rather than individual components -- an approach with roots in electrical engineering and control theory. "We treat high-speed turbulent jets as amplifiers that take turbulent fluctuations inside the jet as inputs and give back sound in the region far away from the jet as outputs," said Mihailo Jovanovi? an associate professor of electrical and computer engineering at the University of Minnesota. "And we use this mathematical framework to identify modes that induce large input-output amplification and generate loud noise." The interdisciplinary research team confirmed the existence of these new modes using high-fidelity simulations of high-speed jets. The researchers numerically solved the compressible Navier-Stokes equations -- which describe the motion of viscous fluids -- by subdividing a high-speed jet flow into hundreds of millions of small pieces. "Each of these small pieces communicates with neighboring pieces to build up a picture of the large range of scales of turbulent motion," said Jinah Jeun a graduate student in aerospace engineering and mechanics at the University of Minnesota. Running such a simulation can require hundreds of thousands of computer processors, simultaneously, on some of the most powerful supercomputers in the world -- housed at the Argonne National Laboratory and at Department of Defense supercomputing centers. "Although high-fidelity simulations consume millions of CPU-hours, we apply our new analysis to extract from them information needed to construct accurate reduced-order models that can be run in minutes on a laptop useful for aeroacoustic design," Jeun said. In terms of applications for the group's work, reducing jet noise has a large impact on the health and safety of airport personnel as well as on communities surrounding airports. Their computations also enable an understanding of physics phenomena that are inaccessible experimentally, for example because they happen in an extreme environment that can't be outfitted with sensors. "Input-output analysis, for example, may be applied to figure out how upstream turbulence inside the nozzle affects flow downstream," Jeun noted. In general, noise is a fascinating way to find structure in otherwise chaotic flows because of its sensitivity to coherence. As such, these simulation and analysis techniques can be applied to "a broader range of problems, such as understanding instabilities in the wakes of wind turbines, investigating acoustic-flame interactions for the design of safer and more efficient combustion, and explaining shock-induced transition in hypersonic boundary layers," Nichols said.